Hickory is a city located primarily in Catawba County, North Carolina , with parts in adjoining Burke and Caldwell counties. The city's population at the 2010 census was 40,010,  with an estimated population in 2015 of 40,374. 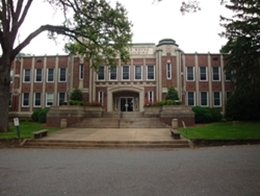 Hickory is the principal city in the Hickory–Lenoir–Morganton MSA , in which the population at the 2010 census was 365,497 and is included as part of the Charlotte–Concord Combined Statistical Area . Hickory is located in western Catawba County at (35.737682, −81.328372),  and extends westward into Burke County and Caldwell County. Interstate 40 passes through the southern part of the city, leading east 68 miles (109 km) to Winston-Salem and west 75 miles (121 km) to Asheville . 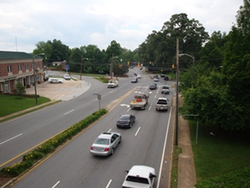 U.S. Route 70 (Conover Boulevard) is an older east-west route through the city. U.S. Route 321 passes through the western part of the city, leading northwest 43 miles (69 km) to Boone and south 36 miles (58 km) to Gastonia . Apart from Hickory, the MSA includes Lenoir , Morganton , Conover , and Newton , along with a number of smaller incorporated towns: Sawmills , Granite Falls , Valdese , Long View , Gamewell , Hudson , Maiden , Cajah's Mountain , Hildebran , and Taylorsville . Several sizable unincorporated rural and suburban communities are also located nearby: Drexel , Connelly Springs , Glen Alpine , Claremont , Rutherford College , Catawba , Cedar Rock , and Brookford . The Hickory Regional Airport is located in the western portion of the city and provides general aviation services. The airport is not serviced by a commercial airline given the proximity to larger nearby airports, particularly Charlotte-Douglas International Airport and Piedmont Triad International Airport . Greenway Public Transportation operates six fixed bus routes around Hickory, Conover and Newton . Greenway also provides paratransit services to these cities and surrounding areas. Greenway Public Transportation provides over 250,000 trips each year to residents living in the Hickory region. As of the census of 2010, there were 40,093 people, 18,719 households, and 9,952 families residing in the city. There were 18,719 housing units at an average density of 640.4 per square mile (227.9/km²). The racial composition of the city was: 74.9% White , 14.3% Black or African American , 11.4% Hispanic or Latino American , 3.2% Asian American , 0.19% Native American , 0.06% Native Hawaiian or Other Pacific Islander , 3.08% some other race , and 1.46% two or more races . In the city, the age distribution of the population shows 23.3% under the age of 18, 11.2% from 18 to 24, 30.7% from 25 to 44, 21.3% from 45 to 64, and 13.6% who were 65 years of age or older. The median age was 35 years. For every 100 females there were 92.8 males. For every 100 females age 18 and over, there were 89.7 males. The median income for a household in the city was $37,236, and the median income for a family was $47,522. Males had a median income of $31,486 versus $23,666 for females. The per capita income for the city was $23,263. About 8.4% of families and 11.3% of the population were below the poverty line , including 14.8% of those under age 18 and 7.0% of those age 65 or over. The City of Hickory operates under a Council–manager form of government, the first city to do so in North Carolina. The City Council is composed of six aldermen and a mayor. The City Manager is appointed by City Council and is responsible for the day-to-day operations of the city. The city employs over 650 staff across 45 departments, divisions, and offices to carryout its governmental functions. The furniture industry in Hickory is not as strong as in the decades previous, but still a primary component in the area economy, and includes HSM (formerly Hickory Springs, founded 1944), a leading manufacturer of mattress coils . Hickory is the retail hub of the foothills and Unifour region, and is home to the largest shopping mall in the region Valley Hills Mall . Hickory is home to the Hickory Crawdads , a Class-A South Atlantic League minor-league baseball affiliate of the Texas Rangers . The Crawdads play in L.P. Frans Stadium located in the western portion of the city, near the Hickory Regional Airport. Hickory is also home to the Hickory Motor Speedway , nationally known as the Birthplace of the NASCAR Stars . The speedway was opened in 1951 and features a 1/2 mile track with seating for approximately 5,000 spectators. Lenoir-Rhyne University participates within NCAA Division II athletics in the South Atlantic Conference . The university's athletics program includes teams in baseball, basketball, football, lacrosse, soccer, softball, and volleyball. Lake Hickory was created on the Catawba River in 1927 with the completion of the Oxford Dam 11 miles (18 km) northeast of Hickory. The dam parallels the NC Highway 16 bridge over the Catawba River between Interstate 40 and Taylorsville . It is 122 feet (37 m) high, with an overall length of 1,200 feet (370 m). The spillway section of the dam is 550 feet (170 m) long. Lake Hickory was named after the City of Hickory and runs along its northern edge. The lake covers almost 4,223 acres (17.09 km 2 ) with 105 miles (169 km) of shoreline. Full pond elevation is 935 feet (285 m). Lake Hickory is a reliable source of water for the Cities of Hickory and Conover and the Town of Long View , while also functioning as a recreation hub for boating, fishing, and other water based activities. Duke Energy provides five public access areas on the lake in cooperation with the North Carolina Wildlife Resources Commission . WHKY , 1290 AM, is a radio station that features a news-talk format. WAIZ , "63 Big Ways", 630 AM, is a radio station that features 1950s and 1960s oldies and recreates the format of Charlotte Top 40 legend "61 Big Ways"
Local television station is WHKY-TV , channel 14. Andy Houston , former NASCAR Camping World Truck Series driver and spotter for Austin Dillon in the Sprint Cup series. All information for Hickory, North Carolina's wiki comes from the below links. Any source is valid, including Twitter, Facebook, Instagram, and LinkedIn. Pictures, videos, biodata, and files relating to Hickory, North Carolina are also acceptable encyclopedic sources. "Census of Population and Housing"
"Council ‐ Manager Form of Government"
"Paul Thompson « Hickory Well Crafted-Work"
"Geographic Identifiers: 2010 Demographic Profile Data (G001): Hickory city, North Carolina"
"Annual Estimates of the Resident Population: April 1, 2010 to July 1, 2013 (PEPANNRES)"
"National Register of Historic Places Listings"
"US Gazetteer files: 2010, 2000, and 1990"
Other wiki pages related to Hickory, North Carolina.